Discussion in 'Accepted/Active Characters' started by Mista Squishy, 16 February 2018. Appearance: Dull brown coat, grey and light grey mane and tail, various facial blemishes from his old age, well kept hair, coat and attire. He has kindly and soft facial features with purple eyes. Usually wears a deep purple cloak due. Special Talent: His cutie mark is a purple book with stars and swirls emanating from inside the book, symbolising his prowess and talent with magic. His main focus in magic is magic the affects the mind, from illusions to dream magic to mind-altering magic, Though he keeps such magics to himself due to their dangerous nature and potential in the wrong hands. He instead acts as a lore master and adviser on magical events due to his vast knowledge of all magic, not just what he practises. Personality: Trick is quite reserved and to himself, as he's outlived many of his friends and barely mingles outside of work. 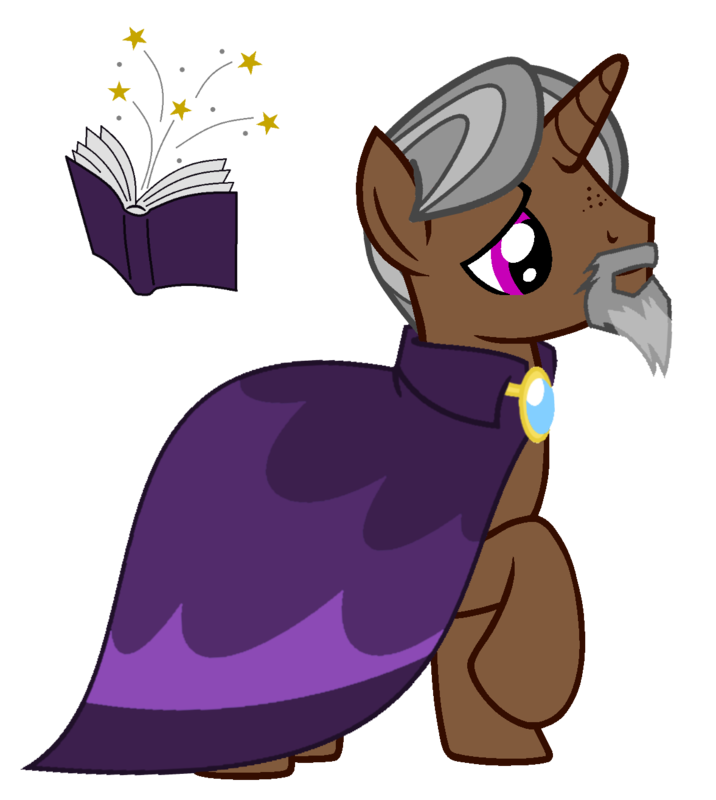 The dedication to his work means the only individuals that generally know of him or know much about him are those he's worked with several times or who have sought out his advice and or knowledge; such at the princesses of Equestria, various nobles and the Captains of both The Lunar and Royal Guard. He also has a relatively short temper when it comes to generally rude individuals, though he won't lash out or raise his voice when angered, he'll instead remove them from his sight, forcibly (teleporting) or by request, or simply ignore them and continuing to engage with others, if talking to a group. That aside he is quite a gentle and kindly old man, much like an ideal grandpa, though he is still secretive unless he trusts certain individuals. His old age, makes him slow and fragile and so he is very defensive and utilises his magic more so then he would have if he were 20 years younger. Perhaps making people believe he is somewhere else by using an illusion or using his magic to throw his voice, making it sound as though he's on the other side of a room. This is how he developed the nickname "Trick". History: Mirage was Born and Raised in the Crystal Empire before the arrival of King Sombra, Being one of the magical advisors to Princess Amore before The Empire was transported into a Temporal Time-stopped Stasis. So in actuality he is technically much older than his physical age, though even he doesn't know how long it's been to the rest of the world. After the arrival of the Crystal Empire Mirage decided to travel, and expand his knowledge on the mind, it's emotions, and the effects and applications of magic that affects them, inspired by the power and magic of the crystal heart. His travels brought him to Canterlot where he found a quiet residence and now studies in the Royal Archives, in exchange for his services. Great looking character. Have fun using him in the roleplays.